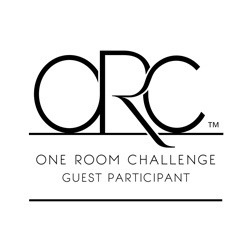 Welcome to Week Three of the One Room Challenge! Can you believe this marks the halfway point of the challenge? I certainly can’t! 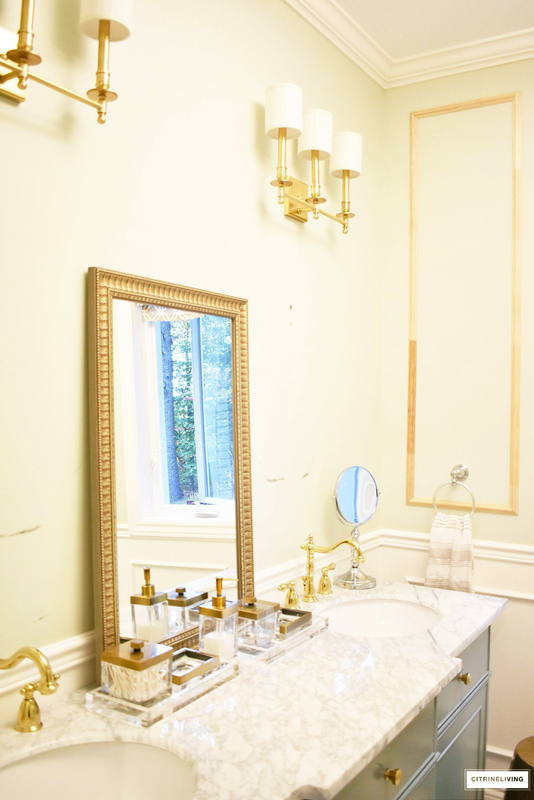 Time is flying and although I’m so excited to get our master bathroom makeover finished, now I’m getting a little nervous! This week’s progress has been pretty good, but we still have quite a way to go. Here’s a quick recap of what’s happening over here…the ORC is a six week blogging event, hosted by Linda of Calling it Home. Twenty design bloggers are asked to participate and show off their design skills, and anyone else who wishes to participate can join in as a guest participant…that’s yours truly! Also, if you’re not caught up to speed, please have a look at WEEK ONE and WEEK TWO to see what’s been going on! 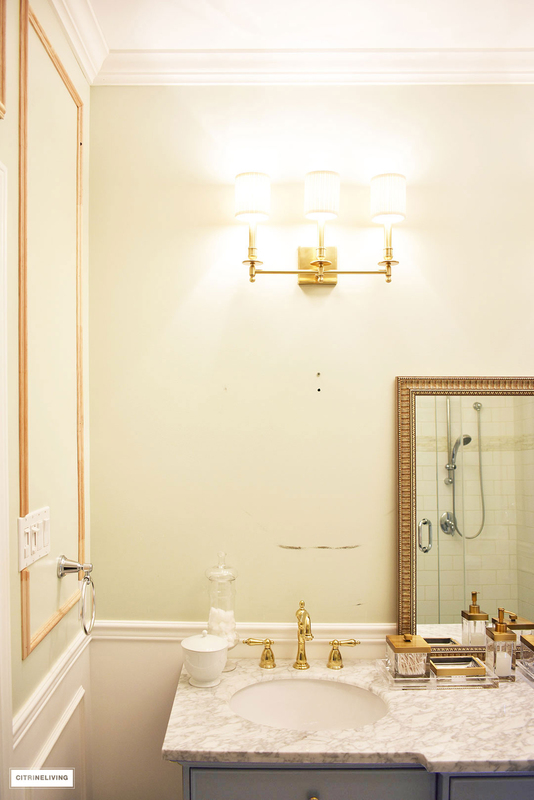 Above is a reminder of where we started – a vintage dresser for our vanity, simple wall hung mirrors and downward facing wall sconces. All of the fixtures and lighting were chrome. It was feminine and pretty and served us well for seven plus years. With our new design, it’s more refined and elegant, yet has a masculine and tailored vibe as well. Mixing metals is one of my favorite things to do and there’s no shortage of that in this space. So let’s get started on this week’s progress! Please bare with me – I had to take the majority of these photos late in the day, so the lighting is not great at all. As you can, see, we’ve started to install the wall molding. We’re using 1″ pine trim and cutting it on a 45 degree angle at the corners. These boxes line up with the existing boxes below the chair rail, and have a 4″ allowance all the way around. One of the things we decided to remove from our to-do list, is a recessed shelf above the toilet. I’m not sure I’ll love the look, so we decided we’d tackle that some time in the future. This weekend coming, we’ll be filling all these holes, caulking the edges, and painting everything a crisp, bright white, Ultra Pure White by Behr. I can’t wait to get a fresh and clean palette going in here! 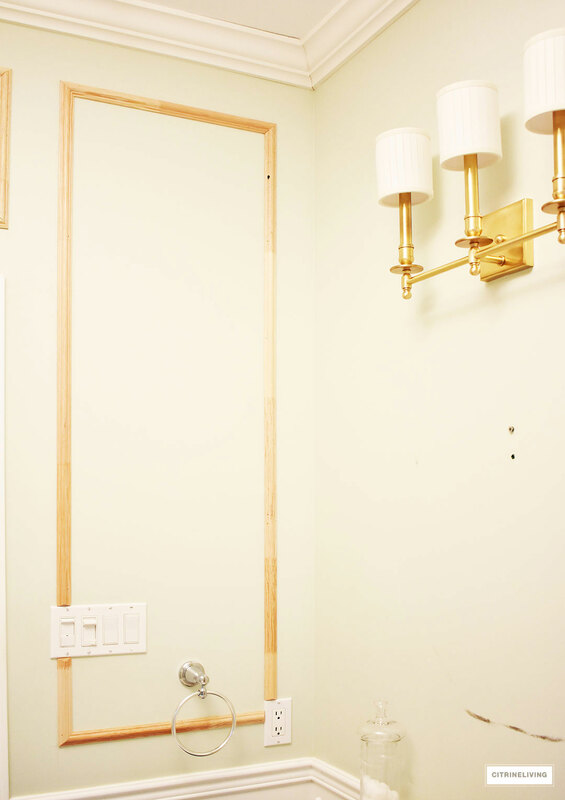 These moldings are simple to install if you’re handy. If not, you need to hire this job out, but just know this is not overly labor intensive – just make sure to do your homework when getting pricing! 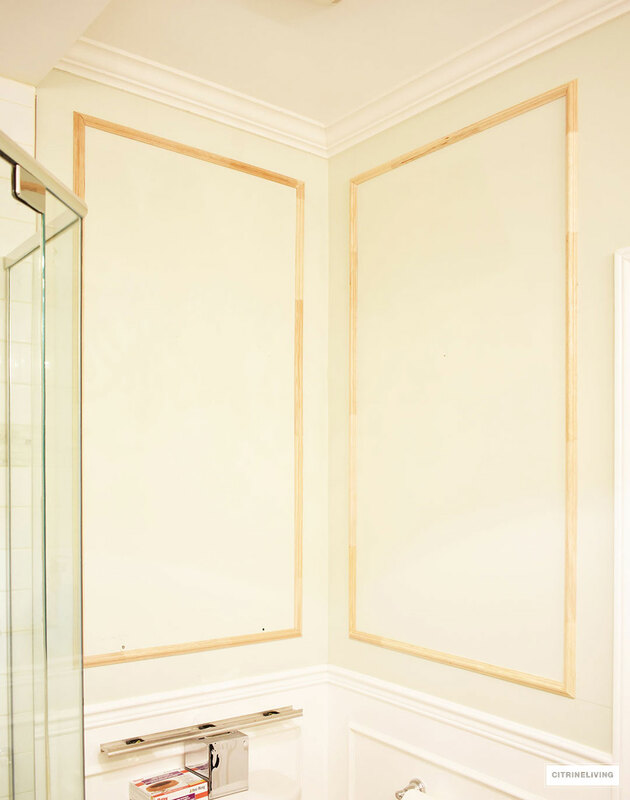 This method of panelling is very affordable and far less expensive than traditional raised panelling. We ran into a small issue when it came to installing molding in this corner. 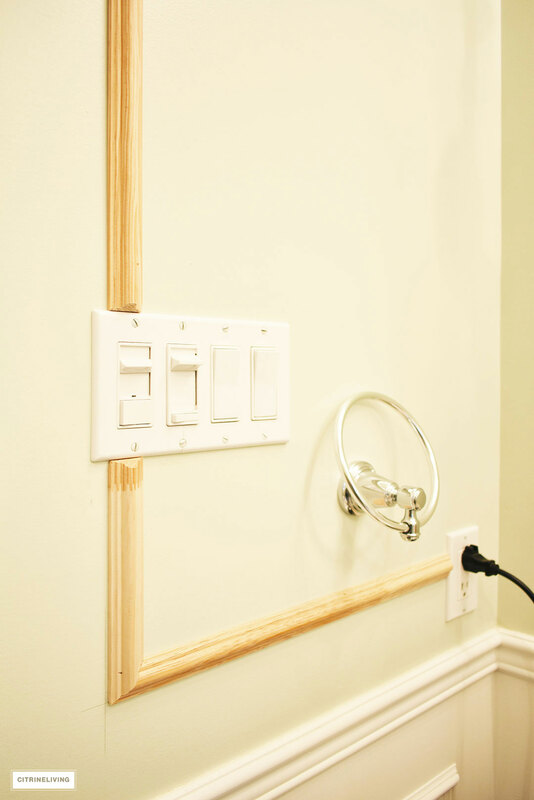 I’ve often seen panelling applied in a way that it runs around the switch or outlet, and personally, I love it done that way. However, we weren’t able to work that out here, simply because of the two odd shapes it would have created in the box, so we opted to cut the edges on a 45 degree angle, where the wood meets the covers. Once it’s all painted out white, hopefully it will be less visible! You must have noticed that we went ahead and installed our new lighting before painting and installing our mirrors. We ended up selling everything in our bathroom (Woohoo! ), and obviously needed lighting in here, so we had no choice but to put them up. It’s no big deal to have them removed and reinstalled, we’re just working a little bit backwards in this process! We need to use brighter, whiter lightbulbs for better light quality as well – which will make a very big difference in here! Below is a sneak peek of the ceiling light too…I am soooo in love! 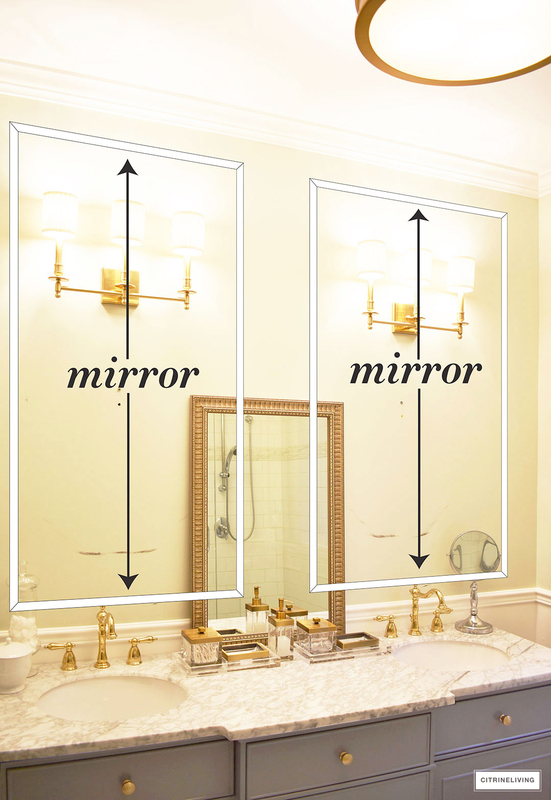 Below is a rendering we sent to the mirror manufacturer. This helps give you a visual of how it will all look. It is going to be amazing! Just having these tall moldings on the walls around the room already makes the space feel twice as big. Once the mirrors are in and everything is painted white, it will look even bigger and much brighter in here. What of you think of our wall sconces? 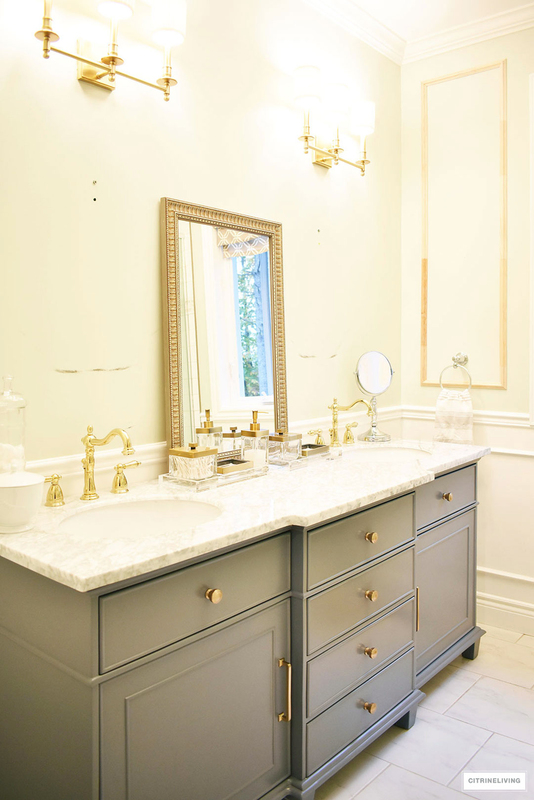 We absolutely LOVE the old world elegance they bring to our space and they compliment our vanity perfectly. They point upward rather than downward, like the previous ones that were here, which also helps to enhance the vertical space and creates height. We had the same experience in our kids’ bathroom when we updated it this past Summer. You can see it here. Lighting truly is the jewelry in any room and can completely transform any space. It’s so important to make the right choices when updating your lighting. Not only the style, color and finish, but the size and scale are paramount. I’m a huge believer in large scale lighting whenever possible. It’s always better to go big than small, trust me on that! Right now I have a lot of accessories lined up along the counter surface. I’m trying different things out to see what combination I like best, but I’ll only know once the mirrors are installed and I have a clutter free counter to work with. In the meantime, below is our to-do list…there are still a lot of items to cross off! 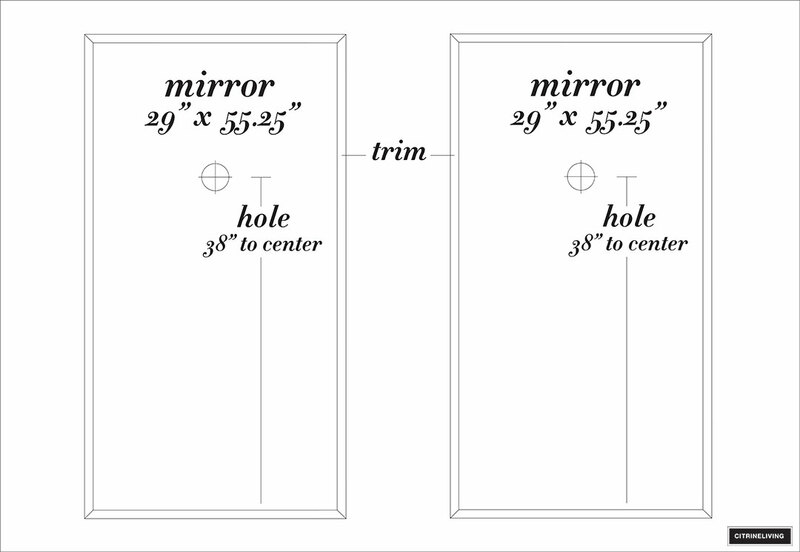 CUSTOM MIRRORS – ON ORDER! YES!!! FINISH IT ALL OFF WITH ACCESSORIES AND ART! Below is my mood board with all of our selections and everything is linked to shop right underneath! 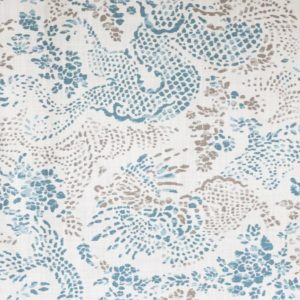 To shop my roman blind fabric, click here. As usual, I’d like to thank our main sponsor, The Mine for helping me throughout our process – they’ve been fabulous to work with and so flexible! As well as Tonic Living for providing our custom roman blind that I know will be the perfect finishing detail! You are getting so much done! It already looks great! 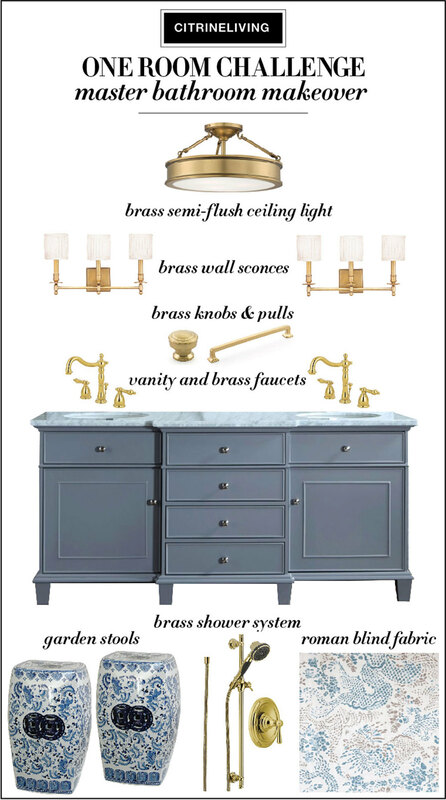 the new brass lighting and plumbing fixtures are gorgeous and I can hardly wait to see them installed! Great progress my friend! This room is going to be gorgeous! I love everything you have done. So elegant!! Linda thank you, I am thrilled that you like it so much! Can’t wait to get it all finished! Thanks so much for stopping by!! 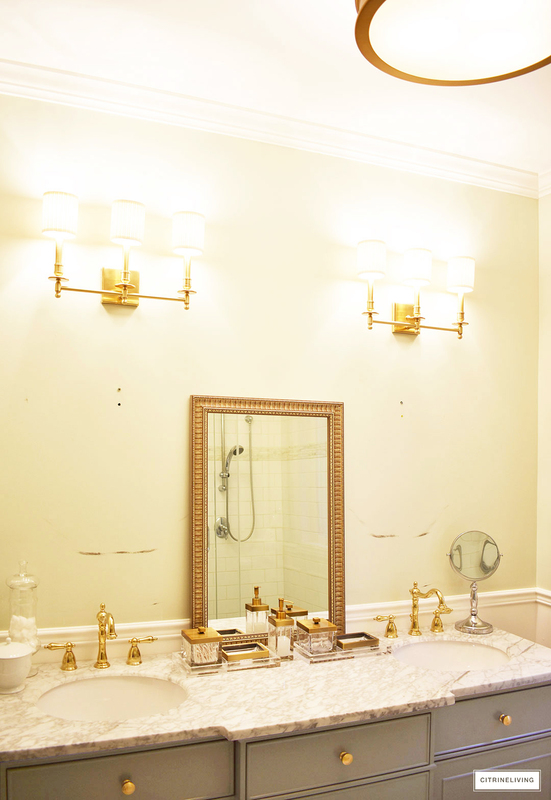 I am in love with your sconces! I have that paneling in my living room and bedroom and it is one of my favorite elements. It will look amazing when it is painted!!! Ahsley thank you so much! We love them too and love the character they bring to our bathroom! Can’t wait to check out your updates this week! It’s looking SO good, Tamara! 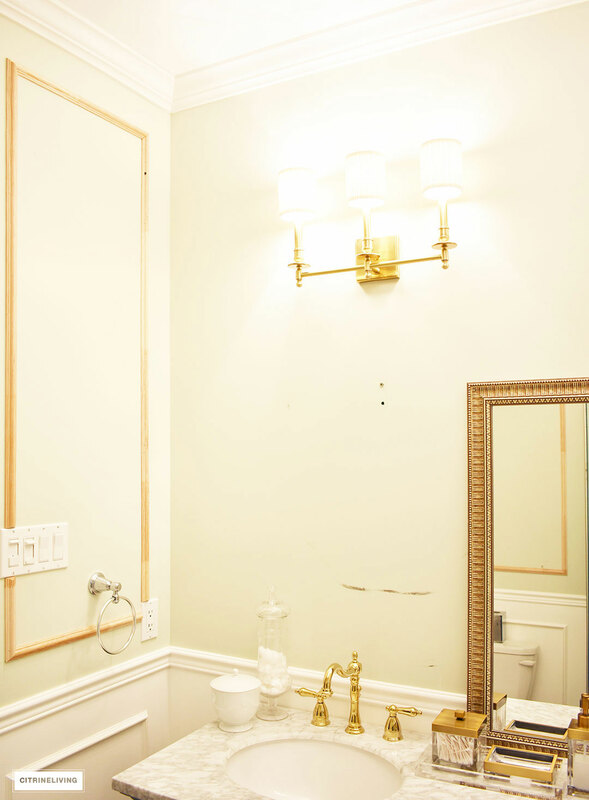 The brass sconces and the molding are gorgeous! Excited to see it finished! Thank you so much Elizabeth! WE are really excited to see it all come together! Can’t wait to paint it for a whole new look! Already such a difference! I love the finishes you have chosen and the addition of the molding is going to be super awesome too! 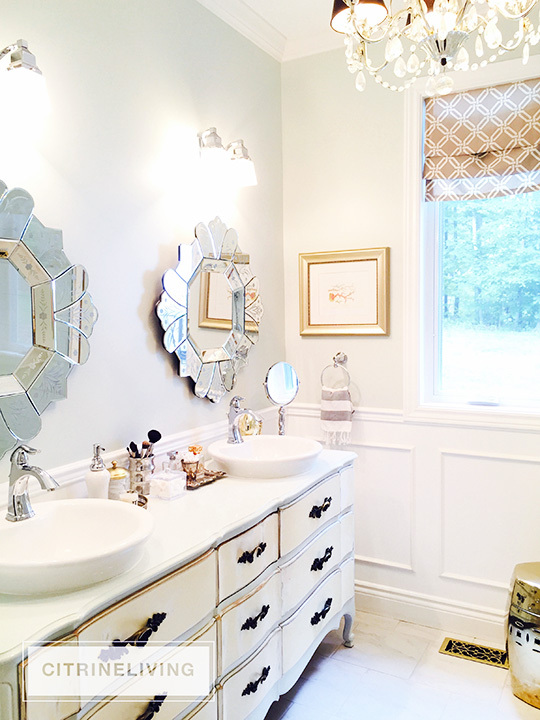 I have two master bathrooms to renovate…you are inspiring me so much!!! 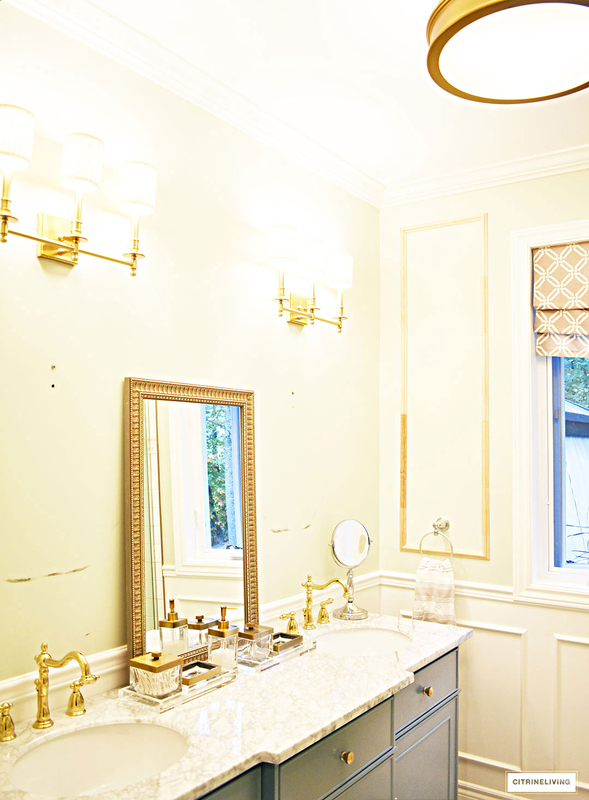 I love looking at what the other bathroom makeovers are doing and you’ve got so much accomplished already! 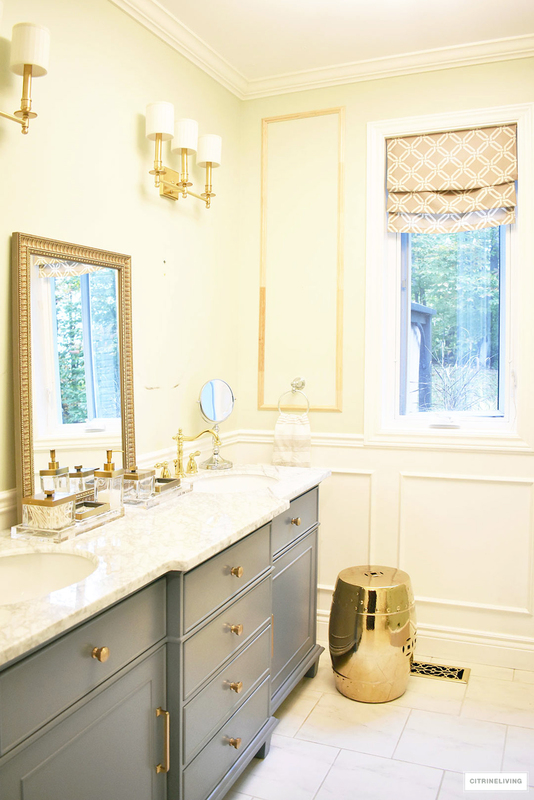 Absolutely love the new vanity – great color with the “brass” fixtures. Can’t wait to see the finished space! It’s all coming together nicely! Loving the new vanity!!! Tam everything is really coming along! I’m loving all the brass accents with your signature blue and white! You are so talented my friend! Tam, it is coming together beautifully! I think your molding is going to be amazing all painted in the final. And those lights! All the heart eyes! Thank you so much! We painted this past week and what a difference it makes! So excited to finish it all!